The happiest place on Earth just announced some new rules that may leave prospective Disney theme park visitors with mixed feelings. Oversized strollers -- the kind that can easily clog up walkways -- will soon be banned inside Disney theme parks in Florida and California, potentially creating a headache for parents. Disney announced the new stroller-related regulations along with new rules related to smoking and “loose or dry ice” in a statement on Thursday. The changes go into effect at all Disney theme parks on the East and West coasts on May 1. According to Disney, strollers larger than 31 inches wide and 52 inches long will no longer be allowed inside the parks. The current policy allows strollers smaller than 36 inches wide. 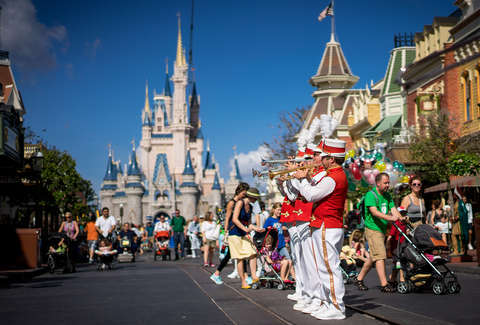 Additionally, “stroller wagons will no longer be permitted.” While some parents are up in arms over the new policy, Disney maintains that it’s not that big a deal. “The good news -- many strollers on the market, including many double jogging strollers, fit within these size guidelines,” the company said. The stroller crackdown appears to be a way to ease congestion inside parks ahead of the opening of Star Wars: Galaxy’s Edge on both coasts. “These updates are designed to help guest flow and ease congestion, making parks more enjoyable for everyone,” Disney said. Judging by the comments section of the announcement, parents are conflicted on the ban. Some were happy to see them go because they “take up so much room,” while others noted that it could create issues for little ones with certain limitations. Other shakeups at Disney include the removal of designated smoking areas inside theme parks and a ban on “loose or dry ice,” which is in effect now. Designated smoking areas will be established outside theme park entrances for people needing a nicotine fix before hitting Space Mountain. The ice ban only pertains to loose cubes inside coolers, so you can still carry your ice inside a resealable bag and get in just fine. Those in need of ice to keep snacks or drinks cool can also request complimentary cups of ice at drink stands inside the park or spend a few extra bucks on reusable ice packs before hand. If you’re heading to Disney in the near future, be sure to read through the new rules. Nothing will ruin your trip like being turned away for an oversized stroller or trying to smuggle in loose ice cubes. Don’t be that person.